Cuddle Bunny companion or pet rabbit feed was specially formulated reduce obesity in rabbits that are just house pets. Our feed with the help of a local veterinarian and our own nutritionist put together an outstanding feed for these little fluffs of love. The feed is timothy hay based, and does not contain corn or soybean meal. It is also very low in fat and the protein level is set at just 10%. There are no flavors, medications, fillers, or binding agents used in making of this product. 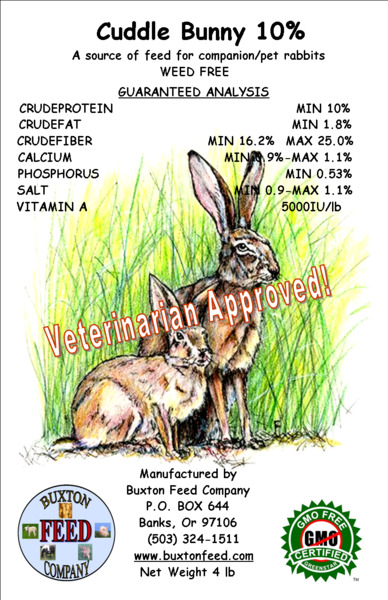 The feed is also 100% Certified NON-GMO, which should help extend the life of your bunny without issues with the effects of GMO grains. Our feed is also backed by a 100% money back guaranty of the purchase price (less shipping and handling), if the feed does not meet with your expectations within the first 30 days of purchase.